In a tweet, Mr Trump said the currency was weak against "our very strong dollar", adding that "US relations with Turkey are not good at this time". Turkish President Recep Tayyip Erdogan said in a speech that the drop was part of a "campaign" led by foreign powers. 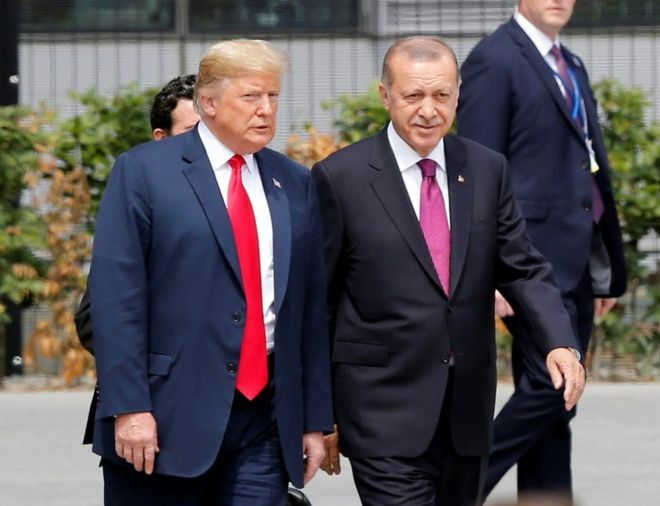 "The United States should know that the only result that such sanctions and pressure will bring... will be harming our relationship as allies," the Turkish foreign ministry said in a statement. The two Nato members are at odds on a range of issues - how to fight the Islamic State group, Ankara's plans to buy Russian missile defence systems and how to punish the alleged plotters of a failed coup in Turkey in 2016.